The direct conversion of sunlight into electricity using photovoltaics is becoming an increasingly important technology for renewable energy generation as a replacement for fossil fuels, with applications from large-scale generation to roof-top solar panels and even mobile phones. But photovoltaics still accounts for only a marginal fraction of global energy supply. One of the main reasons for this is the relatively high cost of the base material  silicon  used in the most common type of solar cell. Silicon is a popular medium for solar energy conversion because of its high conversion efficiency, but the growing demand for its use in photovoltaic cells is causing a shortage in the supply of the high-quality silicon required for solar cell applications. Producing the silicon and fabricating the solar cells also requires highly controlled clean rooms for semiconducting processing, which adds to the total manufacturing cost. In addition, there are increased market demands for large-area, light-weight, flexible energy sources for portable electronics and remote-area power. A low-cost, flexible alternative or complement to silicon is critical for the future of photovoltaic technology, says Jie Zhang, photovoltaics program manager and senior scientist at the Synthesis & Integration group of the A*STAR Institute of Materials Research and Engineering (IMRE). Materials researchers are making every endeavor to devise photovoltaic systems that can ease this reliance on silicon. At the IMRE, researchers are developing organic semiconductors, which could potentially replace silicon in solar cells, as part of their printable electronics program. Printable electronics involves the use of polymer-based semiconductor molecules, which can be easily dissolved in solvent like an ink and printed as circuits on flexible films without the need for expensive clean-room facilities. A significant advantage of printable electronics is that the technology is compatible with existing industrial printing techniques. The technology makes it possible to explore applications requiring extreme flexibility, such as flexible displays and electronic paper. The majority of photovoltaic cells are based on crystalline silicon, which is the most expensive form of silicon to produce. A second generation of solar cells based on much cheaper thin-film amorphous silicon on glass or metal is now becoming commercially available in the form of display backlights and similar applications. Photovoltaic cells based on organic molecules are regarded as the third generation of this technology, and the approach is attracting attention because of the possibilities of mechanical flexibility and solution processability. 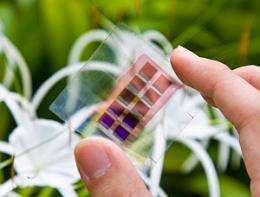 Organic solar cells are also attractive because they are suitable for indoor use  unlike silicon-based devices organics can generate power under the low light conditions of indoor environments. The practical application of organics in photovoltaic cells, however, has been limited due to the poor conversion efficiency of the known organic compounds for natural light. We want to develop organic photovoltaic materials that are as efficient as possible at absorbing photons of sunlight, says Zhikuan Chen, group head and senior scientist of the IMREs Synthesis & Integration group. Chen is responsible for developing high-performance semiconducting polymers. Polythiophene derivatives are the organic materials most widely studied for photovoltaics, and some reports have shown that these materials have high charge mobility, which is an important parameter of photovoltaic cell performance. However, researchers have found it difficult to achieve high conversion efficiency and high charge mobility at the same time. In their most recent study, Chens team combined thiophene with benzothiadiazole to form a copolymer with a narrow energy bandgap suitable for the absorption of sunlight. A field-effect transistor based on this polymer achieved charge mobility comparable to that of commercially available polymer-based field-effect transistors. At the same time, the device achieved a conversion efficiency of 6.26%, one of the best results for a polymer. We are now working on new light-harvesting polymers and new electron-transporting materials to improve the conversion efficiency to 10%, says Chen. At that level of efficiency, the mass-production of organic photovoltaic cells would become viable. The ability to print or deposit organic and inorganic molecules over large areas also opens up a range of new applications for large-area organic photovoltaics, printed electronics and functional films. A*STAR scientists and engineers are now working to resolve a number of manufacturing process challenges as part of a scale-up project conducted by the Singapore Institute of Manufacturing Technology (SIMTech). The scale-up project is led by the team of Albert Lu, a senior scientist and program manager for the Large-Area Processing Programme at SIMTech. Lu and his colleagues are pursuing disruptive technology platforms for roll-to-roll manufacturing of organic and inorganic printable functional materials. This process could be used for the mass-production of both thick- and thin-film devices including sensors, batteries and photovoltaics. The researchers are looking in particular at how ink molecules can be deposited with high precision on flexible substrates of up to 1 meter in width. They are also investigating processes for patterning, embossing and laminating functional films as well as techniques for web inspection and web mechatronics. Unlike conventional electronic circuit fabrication, which requires the batch processing of wafers, large-area processing systems involve a continuous printing-press-like manufacturing process. Roll-to-roll processing poses very different challenges to those of conventional semiconducting processing but is expected to open a new era of printed electronics and functional films, says Lu. SIMTech is currently establishing a pilot production system capable of processing large-area printed electronics and functional films of up to 1 meter in web width. Lu says SIMTech is also collaborating closely with the print and media industry in Singapore to capture rapidly emerging market opportunities and leverage high-speed manufacturing technologies such as inkjet printing, screen printing and flexographic printing. Organic materials are promising for photovoltaics, says Lu, but they will not be able to completely replace silicon. In fact, research into more effective use of silicon is still very much alive. At the A*STAR Institute of Microelectronics, Navab Singh, a principal investigator of the Nano Electronics & Photonics Program, is making microelectronic tweaks to enhance silicons utility in photovoltaics. Classic silicon-based solar cells are made of two layers of different types of silicon  n-type (electron-rich) and p-type (hole-rich)  that are brought into contact to form an electronic junction. Electrical current is generated when light reaching the silicon releases free electron and hole pairs within a short distance from the junction interface. Due to reflection and the absorption of light at locations away from the junction, the number of electronhole pairs participating in power generation is relatively low in the classic structure. To address these shortcomings, Singh and his fellow researchers are attempting to implant hundreds of nano-sized, silicon-based photovoltaic pillars on the silicon surface. When you make nanoscale patterns on the top surface, it not only reduces reflection, but it can also increase the absorption of light inside a very thin silicon layer so that all the carriers can be generated close to the junction. says Singh. This process also reduces the cost of materials. Singh says his teams nanopillar technology requires only a 2 micrometer-thick layer, compared to the 300 micrometer-thick layers needed in previous designs. 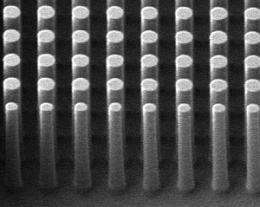 Using this nanopillar technology, Singh and his colleagues recently demonstrated the highest current density so far achieved for nanostructured silicon-based solar cells. They are also looking into other ways to further improve performance. One of the issues under active discussion is how to design the photovoltaic devices so as to make full use of solar energy, such as designing multiple junctions with various silicon alloy materials and designing structures favoring multiple electronhole pair generation. Compatibility with existing semiconductor manufacturing processes is also a key design parameter. We are taking advantage of existing technology to make things more exciting, says Singh.